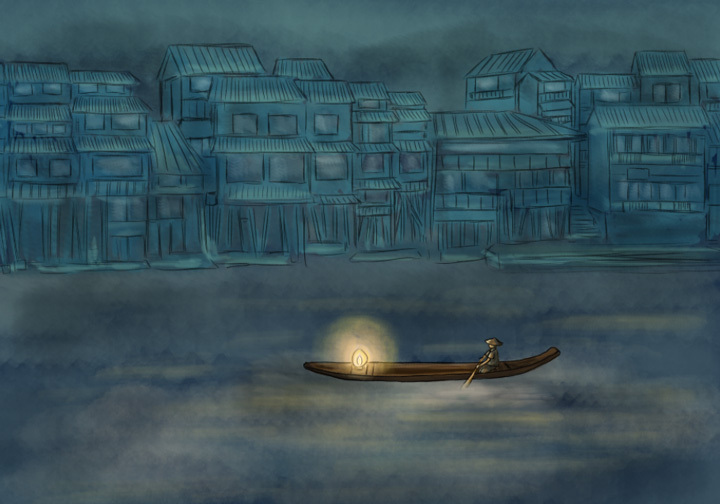 This sketch was inspired by Fenghuang Ancient City in China. I have been there about 5 years ago, when I was still in college. The beautiful scenery of clean river, narrow alleys paved with big chunk stones, special ancient wood buildings, tasty local food and restaurants, the peaceful little ancient town gave me so much memories to remember. I lived in a family inn (which is very common in Fenghuang) for 3 days, and after midnight when I peeked out of the window, I would see the scenery as in the drawing, most bars and restaurants closed, barely with several dim lights on, time to time one or two boats, or candles on little paper boats floating by, while the sound of running river filled the dark foggy night.